Semi-major axis (a) 0.09874 ± 0.00007"
Delta Scorpii (Latinised from δ Scorpii, abbreviated Delta Sco, δ Sco) is a binary star (the presence of a third star in the system is being debated) in the constellation of Scorpius. The primary star is named Dschubba. ρ Ophiuchi region. δ Scorpii is the bright white star on the left (north is down). Delta Scorpii is 2.0 degrees south of the ecliptic. In 1981 it was occulted by Saturn's rings as seen by Voyager 2, with starlight unexpectedly blocked even by the apparently empty gaps, indicating that "there is very little empty space anywhere in the main ring system." Delta Scorpii A is a Gamma Cassiopeiae variable star. This type of star shows irregular slow brightness variations of a few hundredths of a magnitude due to material surrounding the star. In June 2000, Delta Scorpii was observed by Sebastian Otero to be 0.1 magnitudes brighter than normal. Its brightness has varied since then and has reached at least as high as magnitude 1.6, altering the familiar appearance of Scorpius. Spectra taken after the outburst began have shown that the star is throwing off luminous gases from its equatorial region. The companion passed close by in 2011, again resulting in the star peaking at 1.65 between 5 and 15 July 2011.
δ Scorpii (Latinised to Delta Scorpii) is the system's Bayer designation. The two components are designated Delta Scorpii A and B.
Delta Scorpii bore the traditional name Dschubba. In 2016, the International Astronomical Union organized a Working Group on Star Names (WGSN) to catalogue and standardize proper names for stars. The WGSN approved the name Dschubba for δ Scorpii A on 21 August 2016 and it is now so entered in the IAU Catalog of Star Names. In Chinese, 房宿 (Fáng Xiù), meaning Room, refers to an asterism consisting of δ Scorpii, β1 Scorpii, β2 Scorpii, π Scorpii, and ρ Scorpii. Consequently, the Chinese name for δ Scorpii itself is 房宿三 (Fáng Xiù sān), "the Third Star of Room". δ Scorpii was once used as a spectroscopic standard for the B0 IV classification, but is now considered too unusual and variable. The primary, δ Scorpii A, is a B class subgiant surrounded by a disc of material spun off by the rapidly rotating star. The secondary, δ Scorpii B, orbits every 10.5 years in a highly elongated elliptical orbit; it appears to be normal B class main sequence star. There have been reports that Delta Scorpii A is itself a very close spectroscopic binary, but this does not appear to be the case. 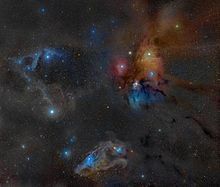 δ Scorpii is a proper motion member of the Upper Scorpius subgroup of the Scorpius–Centaurus OB association, the nearest such co-moving association of massive stars to the Sun. The Upper Scorpius subgroup contains thousands of young stars with mean age 11 million years at average distance of 470 light years (145 parsecs). ^ a b c Gutierrez-Moreno, Adelina; Moreno, Hugo (June 1968). "A photometric investigation of the Scorpio-Centaurus association". Astrophysical Journal Supplement. 15: 459. Bibcode:1968ApJS...15..459G. doi:10.1086/190168. ^ a b c d Miroshnichenko, A. S.; Pasechnik, A. V.; Manset, N.; Carciofi, A. C.; Rivinius, Th. ; Štefl, S.; Gvaramadze, V. V.; Ribeiro, J.; Fernando, A.; Garrel, T.; Knapen, J. H.; Buil, C.; Heathcote, B.; Pollmann, E.; Mauclaire, B.; Thizy, O.; Martin, J.; Zharikov, S. V.; Okazaki, A. T.; Gandet, T. L.; Eversberg, T.; Reinecke, N. (2013). "THE 2011 PERIASTRON PASSAGE OF THE Be BINARY δ Scorpii". The Astrophysical Journal. 766 (2): 119. arXiv:1302.4021. Bibcode:2013ApJ...766..119M. doi:10.1088/0004-637X/766/2/119. ^ a b Balona, L. A.; Dziembowski, W. A. (October 1999). "Excitation and visibility of high-degree modes in stars". Monthly Notices of the Royal Astronomical Society. 309 (1): 221–232. Bibcode:1999MNRAS.309..221B. doi:10.1046/j.1365-8711.1999.02821.x. ^ a b c d e f g h Miroshnichenko, A. S.; Pasechnik, A. V.; Manset, N.; Carciofi, A. C.; Rivinius, Th. ; Štefl, S.; Gvaramadze, V. V.; Ribeiro, J.; Fernando, A.; Garrel, T.; Knapen, J. H.; Buil, C.; Heathcote, B.; Pollmann, E.; Mauclaire, B.; Thizy, O.; Martin, J.; Zharikov, S. V.; Okazaki, A. T.; Gandet, T. L.; Eversberg, T.; Reinecke, N. (2013). "THE 2011 PERIASTRON PASSAGE OF THE Be BINARY δ Scorpii". The Astrophysical Journal. 766 (2): 119. arXiv:1302.4021. Bibcode:2013ApJ...766..119M. doi:10.1088/0004-637X/766/2/119. ^ Evans, D. S. (June 20–24, 1966). Batten, Alan Henry; Heard, John Frederick (eds.). The Revision of the General Catalogue of Radial Velocities. Determination of Radial Velocities and their Applications. 30. University of Toronto: International Astronomical Union. p. 57. Bibcode:1967IAUS...30...57E. ^ a b c de Geus, E. J.; de Zeeuw, P. T.; Lub, J. (June 1989). "Physical parameters of stars in the Scorpio-Centaurus OB association". Astronomy and Astrophysics. 216 (1–2): 44–61. Bibcode:1989A&A...216...44D. ^ Meilland, A.; et al. (August 2011). "The binary Be star δ Scorpii at high spectral and spatial resolution. I. Disk geometry and kinematics before the 2011 periastron". Astronomy & Astrophysics. 532: A80. arXiv:1106.1746. Bibcode:2011A&A...532A..80M. doi:10.1051/0004-6361/201116798. ^ Underhill, A. B.; et al. (November 1979). "Effective temperatures, angular diameters, distances and linear radii for 160 O and B stars". Monthly Notices of the Royal Astronomical Society. 189 (3): 601–605. Bibcode:1979MNRAS.189..601U. doi:10.1093/mnras/189.3.601. ^ a b c d e Mark J. Pecaut; Eric E. Mamajek & Eric J. Bubar (February 2012). "A Revised Age for Upper Scorpius and the Star Formation History among the F-type Members of the Scorpius-Centaurus OB Association". Astrophysical Journal. 746 (2): 154. arXiv:1112.1695. Bibcode:2012ApJ...746..154P. doi:10.1088/0004-637X/746/2/154. ^ a b c Moore, Patrick (2010). "Scorpion in the Sky". The Sky at Night. p. 95. doi:10.1007/978-1-4419-6409-0_24. ISBN 978-1-4419-6408-3. ^ Moore, Patrick (2000). The Data Book of Astronomy. CRC Press. ISBN 9781420033441. This page was last edited on 7 April 2019, at 05:15 (UTC).